Ever since the Japanese government passed the Act on Special Measures concerning the Procurement of Renewable Energy in July, 2012, the amount of grid-connected installation in Japan continued to increase. According to EnergyTrend, a research division of TrendForce, 24.5GW of PV systems have passed the certification, in which, 22.5GW were systems above 10kW. It showed that the focus has started to shift from residential systems to utility-scale power plants after the new Act took place. “Although large amount of PV systems passed the certification, the Japanese government is projected to complete the projects in three years. Also, due to the increased consumption tax and decreased FiT, this year’s PV installation may slightly drop. However, Japan is still a cake that everyone wants a piece since their return rate is higher than other countries and their amount of PV installation will represent 12% of the world’s installation this year,” said Corrine Lin, analyst of EnergyTrend. Due to the EU-China trade war in 2013, major Chinese manufacturers began to search for markets other than Europe. Many of them considered to enter the Japanese market. Indicated by EnergyTrend’s data, Chinese cells and modules exported to Japan in 2H13 reached 2.6GW, representing 30% of China’s total export volume. 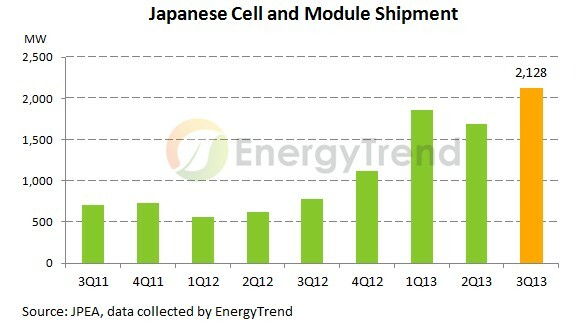 Among all, shipments to Japan exceeded 200MW for Kyocera, Hanwha SolarOne, and Canadian Solar. In terms of Taiwan, Japan was the second largest export country (next to China) for cell manufacturers. Since 2H13, major Taiwanese manufacturers’ shipments to Japan usually represented more than 20% and there must be a certain amount of OEM orders. Based on EnergyTrend’s data, around 500MW of cells exported to Japan in 2H13, representing 14% of Taiwan’s total export. After cells being assembled in China, part of them will also be shipping to Japan. 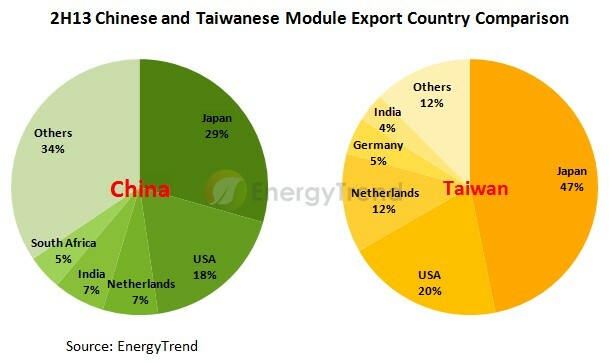 As for modules, Japan was the main export country in Taiwan, accounting for 47% of Taiwan’s total module export volume and 53% of the total export value in 2H13. According to JPEA’s data, cell and module shipment reached a new record, 2.1GW, from July to September 2013, due to Japan’s domestic market demand. The financial performance for Japanese manufacturers was impressive as well. From the 3Q13 financial reports released by the local Japanese manufacturers, the financial performances for Sharp, Panasonic, and Kyocera, were outstanding. The quarterly revenue growth for the three months ended December, 2013 was 29% for Sharp. The operating profit was JP¥5.9 billion and shipment was 459MW. It’s projected that shipment will increase to more than 700MW next quarter. The increased amount of grid-connected installation before the end of fiscal year in March will allow Sharp to revise their annual sales revenue and shipment forecast upward. The main solar products for Panasonic were HIT high-efficiency mono-si modules, which can be used in residential market that requires high conversion efficiency. Thanks to the steady growth in the residential market, the sales revenue within the PV energy system sector grew by 12% YoY to JP97.6billion and it’s likely to keep rising in the entire fiscal year. Because of the steady growth in the Japanese PV market, the sales revenue for Kyocera’s Applied Ceramic Product Group was JP¥68.34 billion for the three months ended Dec. 2013, which rose JP¥17.04 billion compared to 4Q12. The operating profit also increased JP¥3.36 billion from 4Q12. Currently, the full-production status remained for Kyocera. All the Kyocera products produced in Tianjin have been shipped to Japan and products shipped from China to Japan in December, 2013, reached new high. Since April, 2013, the Japanese government revised the FiT for systems above 10kW from JP¥42/kWh to JP¥37.8/kWh. The subsidy rate was still relatively high in contrast to other countries and Japan’s amount of PV system installation in 2013 was higher than the market had expected. Rumors had it that METI may adjust the FiT to JP¥34/kWh in 2014. The consumption tax is likely to be revised upward as well. All of these led to the assumption that PV system installation will definitely decline after 1Q14. Yet, how installers’ IRR will affect the supply chain and whether Japanese manufacturers can benefit from US-China trade war will be the major issues that everyone concerns. PV EXPO will be held in Japan on February 26th-28th, 2014. The growth within the PV market in Japan has turned PV EXPO into a grand gathering that focuses on Japan’s PV market development. EnergyTrend will provide you first-hand news and information promptly. Please pay close attention to EnergyTrend’s PV EXPO2014 features and analyses.